Something has been truly puzzling to me lately. In the swirl of events, there seems to be a larger and larger focus on upheaval and dismay versus anything positive. I am not naive and ache for the constant wave of tragedy that fills every form of media. Honestly I do take time to step away and reflect just to break the pattern. It’s odd to me that we continue to pile on more and more negativity that is happening either to us, or around us, and we expect that the more we scream and tear things down that we’ll hit some basement. I don’t think it’s possible because your “bottom” may not even be close to what’s happening to others. I do my best to personally fight this and encourage others on purpose. I find that even in doing that, there is a push back that occurs because people feel better if you suffer with them. Enough is enough. I will not fall into the trap that I need to tear things down in order to build things up. I just won’t. I know that I’ve written on this topic in the past, and yet it still tugs at me. You see it seems that HR has chosen more to conform to be like the rest of everyone at their company instead of choosing to make a change. We’d rather blend in than stand up. I think we’d do better in understanding that our interactions could literally change the world !! One of my favorite quotes ever is from Ghandi when he encouraged others around him to “be the change you want to see in the world.” We tend to shy away from this expansive aspiration because we think that changing the world would involve some massive effort beyond our abilities. I don’t think that’s the case at all. We just need to reframe how we look at making change. I think there is far too much focus on results in all facets of work and our lives. Results are important, but they don’t lead. They lag. Relationships are far more important and you make change through those relationships. These lead to stronger results. Every. Time. Changing the world isn’t about effort. It’s about people. It always has been. In HR you’re surrounded by people and you can be the ONE person who makes a positive impact for them. A kind word, a listening ear and a willing heart can build up others. These aren’t “soft skills”, they’re human skills. And, make no mistake about it, human skills are what drives business and allows for world shaping change. 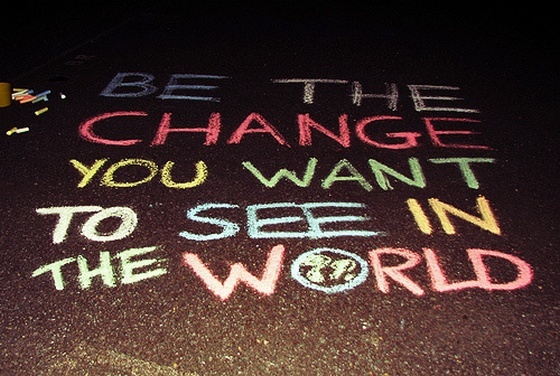 This week I hope you turn away from the negative noise and choose to be a person who can change the world. Pull a star from the heavens and reach out to others and show them that they matter and have value. Trust me, the more of us that make this effort will be the change we want to see in the world !! Author Steve Browne (Admin)Posted on February 3, 2019 February 3, 2019 Categories HR, UncategorizedTags Change, HR, HRonPurpose, HRTribe, Human Resources, Inentional1 Comment on Change the World !! When Winter rears it’s ugly head, it often forces you inside. That can either be insufferable, or a chance to get indoor projects done that you haven’t been able to get to. We’re on the projects end of the spectrum. This weekend’s project was to paint our master bedroom. I looked forward to it because I love to paint !! I mean it. I love painting indoors because it turns out to be me and my iPod. Every time I hear this song played, I get misty. I really do. It’s a gorgeous melody with haunting lyrics that hit you right from the start. Here’s a snippet . . . The song talks about someone willing to be present for someone who’s going through something difficult. The imagery is that they are willing to be the bridge for their friend in order for them to reach the other side of whatever they’re facing. How long can we continue this disinterested stance and feel that we’re being effective? I can hear the resistance that is rising even as I type this. If we don’t watch it, HR is going to make itself so disconnected that there won’t be a reason for us to exist. We have to step in, reach out and be the bridge for others. You have to trust me, from personal experience, that whenever I’ve been a bridge builder great results have occurred. It hasn’t always meant that the person’s situation was completely addressed or that they even stayed with the company. However, the personal touch that they yearned for occurred and started something positive in the midst of the “troubled waters” they were facing. I also think HR people stop being a bridge themselves because they’ve had a bad experience and have been burnt. This never good and is a definite risk. I do think it’s a risk worth taking though because this is more of an exception than the rule. Another factor that makes HR pros hesitate in being bridge builders is that we don’t have someone who will be our bridge when we face difficulties ourselves. I know that I seem to be shouting a similar message over and over, but HR people need to understand that our peers can be a bridge. I have many very close friends that I can reach out to who also reach out to me. It’s not some hokey, professional camaraderie. They are genuine relationships that have developed over social media and also in person. If you don’t have HR peers who are bridge builders, you need to find ones. I will also put this out there . . . I’m willing to be the first person to reach out. You don’t have to face what you’re doing alone. I mean it. You reach out and I’ll be there. It’s time for us to realize that we have an incredible opportunity in front of us. Please join me in reaching out. Be the bridge !! 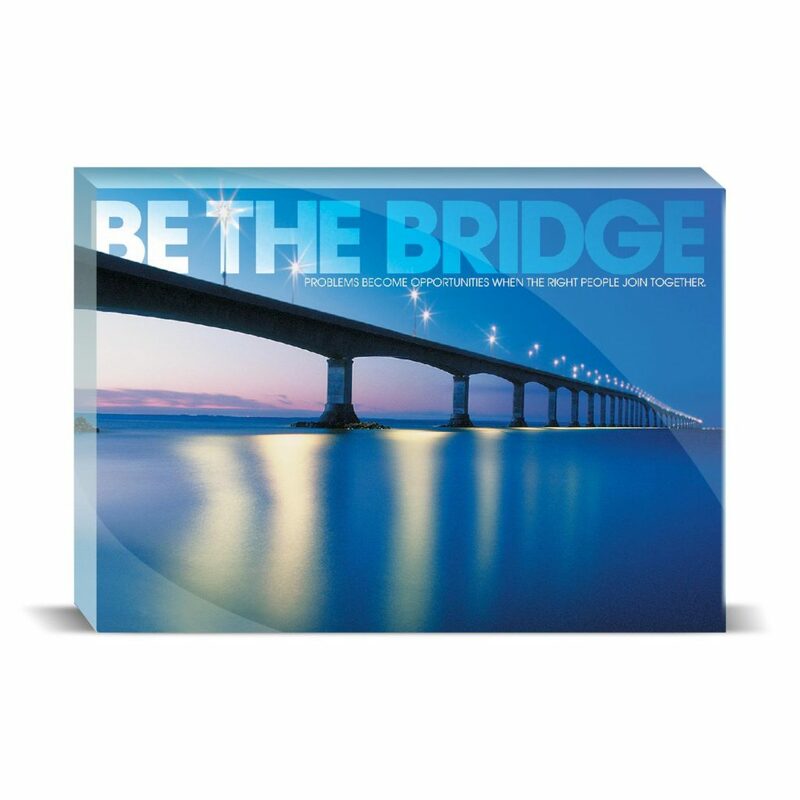 Author Steve Browne (Admin)Posted on January 27, 2019 January 27, 2019 Categories HRTags employees, HR, HRonPurpose, HRTribe, Human Resources, intentional, SHRMLeave a comment on Be the Bridge !! This past week my wife and I went to see Fiddler on the Roof as part of the Broadway Series in Cincinnati. We love seeing live theater, and this is honestly one of my favorite musicals ever !! This version did not disappoint either. It had your attention from the moment the lights went down until the cast was “walking” out of their town of Anetevka to end the musical. If you’ve never seen this great musical, I would highly recommend it. It has a great story line and the songs are all very memorable. The show starts with the powerful song “Tradition” where the various members of the little town in Russia during the turn of the 20th century all sing about their designated role. The main character, Tevye, is both narrator the one who carries the torch of tradition for himself, the townspeople and especially his five daughters. During the opening song, Tevye has a line that says, “You may ask, ‘How did this tradition get started?’ I’ll tell you. I don’t know.” That seems to be the case with most traditions whether they be ones you have in your family or those within organizations. Even though we may not know the origin of traditions, we follow them fully just as they do in the show . . . at least for a while. You see, I think there is value in tradition. Many people get this mixed up with the practice of doing things the same way because that’s “the way things have always been done.” If you come across this type of stagnation, then you have to challenge it and/or change it in some way. There is a natural change that happens in companies just due to the fact of the passing of time and the addition and deletion of people. Any time you get new folks involved on work and projects, change occurs simply because they aren’t the people who were involved in the past. Traditions have their place in companies because they can give you a picture of what has worked in the past. Remember, you can always learn from the past. You just can’t constantly dwell in it. Traditions are an essential part of a company’s culture. They give flavor, distinction and help shape the fabric of what your company offers. These on-going facets are those that critical components of retention. Traditions can be a very positive aspect if they are healthy, living and inclusive. The key movement in the musical is also a great lesson for us as HR professionals in organizations. Tevye wants to desperately hold on to the traditions of his past that you assume happened for generations. His daughters challenge him in every way and break with tradition by choosing a spouse when spouses had been traditionally agreed upon by the father and another family. He reluctantly gives in on the three who choose a partner because he sees all sides of what the change will bring. This includes the hope that his daughters would benefit from breaking with tradition. We should look around within our companies to see what traditions need to be tweaked or altered all together. One reason for this is that making changes will allow for diversity to be present on purpose. You can seek the input of others and make sure the voices of everyone have a chance for input. The goal would be for them to benefit from the changes that happen. Traditions are all around us and we can benefit from having them personally and in our companies. The key is to make sure they are current and relevant. Know why and how you have the traditions that make you great !! Author Steve Browne (Admin)Posted on January 20, 2019 January 20, 2019 Categories HRTags Change, culture, Diversity, HR, HRonPurpose, HRTribe, Human Resources, intentional, SHRM1 Comment on Tradition !! This past weekend we were caught off guard. Our winter in West Chester (just north of Cincinnati) has been unseasonably mild. There have been a few cold days sprinkled in through December and January with far more rain than frost or snow. People were getting comfortable with the higher temperatures, and it lulled us to sleep. We received a notice of a winter storm warning, but we were skeptical. Many, many times our meteorologists make predictions of doom and destruction while a dusting of snow barely covers the tips of the grass. 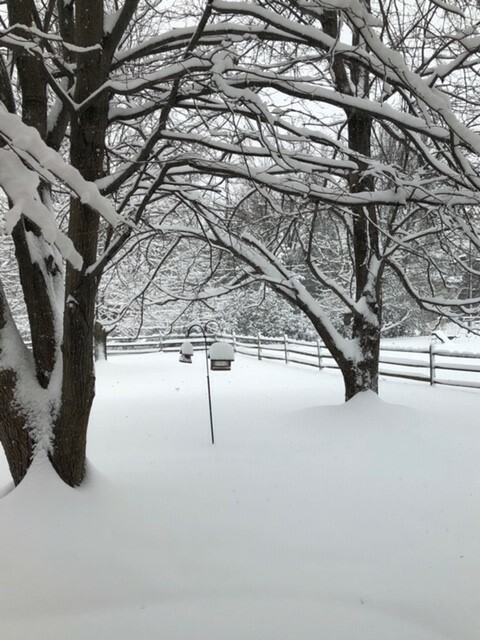 We had 3 to 4 inches fall between Friday and Saturday which is a nuisance, but it didn’t shut things down (as the local news outlets had hoped). Overnight we were supposed to get 1 to 2 more inches. Not really something to fret over. View of our backyard !! Waking up this morning, we were truly surprised. We didn’t get 1 to 2 inches we got 8 inches !! THAT shut things down to start the day. I was planning to head to church and my son was planning on leaving to return for his final semester of college. I did get out on the road, but it was very tentative. I grew up in a part of Ohio that was used to many inches of snow. So, I’m pretty comfortable driving in snowy and icy conditions. Many, however, aren’t. Whenever snow hits here, you’ll see several cars spin out, swerve off the road or get crinkled by running into something or someone. The experience I had this weekend is typical of most situations we face personally and in our organizations. We hear warnings and we may, or may not, heed what’s predicted. The signs of a challenge are all around us, but we don’t think things will be “that” bad. We take the chance that we can get through whatever comes, and many times we can. However, there are storms that do hit very hard. These usually are unpredictable and the circumstances and situations can seem insurmountable. Whenever storms do hit, you have some choices you can make. It’s an option most choose. There is safety in making this choice because you’re in the surroundings where you’re most comfortable. You also probably stocked up and have all of the supplies you need. There’s nothing wrong with staying warm and cozy. I hate to be negative, but storms can bury you. That’s a reality. If a storm presents itself to be so large as to overwhelm you, make sure you have a lifeline to get help. Trying to tackle life on your own is reckless. There’s no value in being a martyr who has every burden stack on them time after time. I realize that people are more isolated than ever these days. Change that and reach out to connect with folks who will be there when the storms hit. You can grab a shovel and take on the conditions that attempt to keep you stymied. It’s not easy to dig out, and it will wear you out. It’s hard to face challenging conditions. At times though, we need to go through the storm in order to get to the other side which will be even brighter than anything the storms throws at us. Storms happen. We don’t look forward to them, but that doesn’t stop them from coming. As an HR professional, remember this because you are surrounded by people that are either in the midst of storms, or one is on the horizon. You have the chance to help them with their choice when it hits. You can help them hunker down and stay safe. You can offer empathy and support to help them not to get overwhelmed. You can also encourage them and stand with them as they venture out to face the storm swirling around them. I don’t think there’s an option to avoid and let people just slog through storms. We need to respect how much a person is willing to let us assist them, but just leaving them alone isn’t acceptable in my opinion. You may be the ONE person who makes a difference because you chose to care. I think HR folks should venture out !! This week take a look at those you work with and assess the weather. You need to be ready because a storm is sure to be on its way . . . Author Steve Browne (Admin)Posted on January 13, 2019 January 13, 2019 Categories HRTags culture, employees, HR, HRonPurpose, HRTribe, Human Resources, SHRM, workplaceLeave a comment on Weathering the Storm !! Guard !! Turn !! Parry !! When I was young, I loved getting up early on Saturday mornings to watch cartoons !! They were fantastic. I would get a bowl of cereal and sit in front of the glowing screen for hours. I especially enjoyed Looney Toons with the hilarious characters of ranging from Bugs Bunny to Daffy Duck. They were five to seven minutes of incredible action, story line and humor. Most of the humor, to be honest, was above my head. That didn’t matter though because they were so different than the other shows that were on. 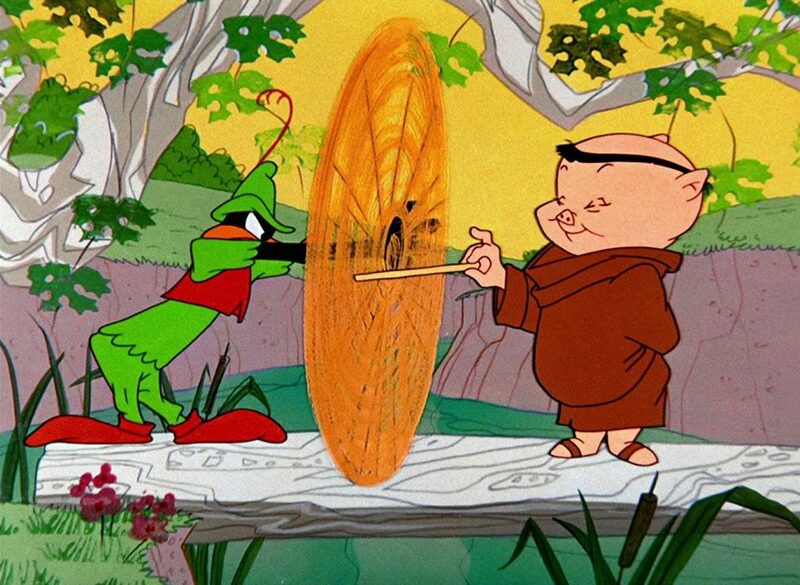 One of my favorite cartoons was Robin Hood Daffy which featured Daffy Duck as Robin Hood and Porky Pig as Friar Tuck. Daffy is exasperated to prove to Porky that he is, in fact, Robin Hood. Porky is suspicious and thinks that Daffy is a bumbling buffoon who is far from the hero who robs from the rich and gives to the poor. Most of the cartoon proves that Porky is right. In one scene Daffy is crossing a log over a stream with a long stick which he uses for several moves, but ends up hitting himself in the face and bending his bill back towards his face. He tries the moves over and over with the same result. He even talks his way through it with confidence exclaiming, “Ho! Ha ha! Guard! Turn! Parry! Dodge! Spin! Ha! Thrust!,” and then “Sproing!” his bill snaps back. During this endless, futile exercise, Porky steps up with a small stick and thwarts Daffy by inserting it into his moves during his spin. It’s hilarious !! The reason I bring this up is that I find that most HR people spend so much time going through much of the same futile regimen that Daffy Duck does with the same result. Instead of being intentional and direct with people we dodge, spin, guard, parry and thrust. The only thing missing is screaming the “Ho Ha ! !” distraction. Doesn’t that just tire you out? The constant maneuvering to skirt along the edges of employee interactions just in case you’re called into action. Inevitably, an employee comes up with their small stick and throws you into the stream. HR should never be the buffoon that has to try to prove who they are either. It’s another giant waste of energy and time. We are looking for constant affirmation and acknowledgement by those that may, or may not, matter within the organization. This too is tiring and is discouraging for those who practice Human Resources. Look, it’s a New Year. Let’s not be the Looney Toon character anymore. Don’t get me wrong, I think there’s immeasurable room for humor, color and animation !! Those things bring life to ourselves, others and organizations as a whole. I would just encourage you to no longer go through wasted motions that seem like thrashing around just to be seen as busy. Be intentional. Be among your employees. Be spectacular and give them the HR professional they deserve !! When you do that, you’ll be working alongside the great people you have and quit having to pull yourself out of the stream. Author Steve Browne (Admin)Posted on January 6, 2019 January 6, 2019 Categories HRTags Approach, employees, HR, HRonPurpose, HRTribe, Human Resources, SHRM, workplaceLeave a comment on Guard !! Turn !! Parry !! The Coming Year . . . I remember gathering at a friend’s house in 1999 for New Year’s Eve. The party was very casual and the crowd was made up of several couples with many little kids running around. The excitement was high because as the ball was going to drop and become the year 2000 we wondered if Y2K was actually going to occur. There was some anxiety mixed with a ton of skepticism. We counted down, 5 . . . 4 . . . 3 . . . 2 . . . 1 !! And, then the power went out completely in the house. It was pitch black and we thought that Y2K did happen. We all scurried to grab our things and get to our houses when the power returned. Todd, the home owner, came around the corner laughing heartily with his drink in hand. “Just kidding ! !” We all pelted him with a barrage of Boo’s and then joined him in uproarious laughter as well. So, here we are two decades later and we’re on the verge of stepping into yet another New Year. I’d have to say that many are still filled with a mix of anxiety along with skepticism. This may not be unique because every year we are faced with situations of all types. There may be personal challenges, personal opportunities or even larger scale circumstances that stand in front of us. Many people will make a series of resolutions with the best intentions of keeping them, and they will have limited success. I have never been one to make resolutions because the areas of my life that I need to work on have a longer window than just to get started every January. Also, I know that when I’ve tried to make massive life jumps or switches, I fall back into my regular pattern way too easily. So, am I going to do anything differently in the coming year? I wouldn’t classify my approach as “different”, but I would say that it’s going to be even more intentional. I want to connect HR pros to each other even more than I have in the past !! I also want to see people interact with each other with respect and grace even in the midst of differing opinions. I continue to be astonished at the number of HR practitioners who try to conduct their jobs on their own. They may even be part of a larger HR team within an organization. Why do we think isolation will enable us to be effective and viable in HR? We absolutely must break this paradigm !! There is so much value in being connected to others who do what you do. This can happen through social media as well as in person. Please join me in helping others in HR connect with other practitioners. Let’s eliminate this facet of our profession for good. While making connections, we need to step up as HR pros to facilitate AND participate in dialogue and discussions regarding the challenging issues in the workplace, our industry and the country. These conversations should lead to action which not only addresses issues, but does it in a way to move organizations forward. I would ask that we allow for true dialogue which considers all perspectives that is supported by respect and grace. This is overdue in all areas of our work. 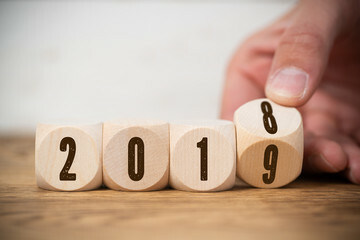 I’m looking forward to 2019. I think it’s a chance for us to be positive and lift each other up. I hope you find the areas in your life that you’d like to continue, and that you’re successful. Happy New Year my friends !! Author Steve Browne (Admin)Posted on December 30, 2018 December 30, 2018 Categories HRTags Global HR, HR, HRonPurpose, HRTribe, Human Resources, intentional, Nextchat, SHRMLeave a comment on The Coming Year . . . This past weekend I ventured out once again to finish my Christmas shopping. The weather was absolutely atrocious because of an endless, soaking rain. I would not be deterred because this was my one completely free day. I didn’t mind the rain, the snail like traffic, or the myriad of people who must have had the same idea I did. One stop along my day long trek was at a brand name store that was an anchor location at a shopping mall. I was able to find what I was looking for there, and I wanted to stay dry for a bit longer so I decided to walk through the old mall. I was floored by the vast emptiness of the once robust gathering place. It was honestly a bit unnerving. Over 3/4 of the store fronts were blacked out and their logos were nothing but faded outlines that could barely be made out. Now, I understand that business evolves. People do less and less shopping out in public. Many of us sit in our living room on our couch and place orders online. I’m not against this at all because it is easier to press a button and have something placed outside your front door. What I miss though is seeing people. Seriously. I love the hustle and bustle of people milling among each other. I don’t mind waiting in lines and listening to what people are discussing. I get energized by it !! You see the empty shopping mall reflects one thing that is occurring that I’m not geeked about. More and more people are choosing convenience over community. This is a pretty broad generalization, but there are countless examples of how we want to have things brought to us so we don’t “waste time.” There is nothing wrong with being efficient. But, in doing this we aren’t coming together in other ways. We’re becoming increasingly isolated intentionally. The major concern about this move towards isolation is that we accept it as the norm. There is little push back against being slowly lulled apart. I understand that I am an off the chart extrovert, and that weighs into how I feel. However, I see convenience being touted as being so much more attractive in all facets of life. During the holiday season, it’s well known that people struggle. There are many reasons for this and all of them are valid. With that before us, the last thing we need is a move to more isolation. Well, I for one, don’t want HR and the workplace to go the way of the shopping mall. It’s going to happen if we don’t pivot and change now. I mean it. The call for convenience is hoping that we move farther and farther apart. I understand that you may not feel comfortable connecting with tons and tons of people. Please don’t take this request to the extreme. You have the opportunity to start/build your community by intentionally reaching out to ONE person. One !! This is true because it takes only one person to step out of isolation and into the midst of another’s life on purpose. I can’t tell you how much I am driven by this feeling to see this change in our profession and in our company cultures. This week, reach out to one person. You may be the absolute break from the isolation they’re experiencing right at this moment. It’s time for all of us to make a difference in the lives of others. Let’s finish 2018 building our community so that 2019 and the future will evolve as others come together. Always remember . . . we are better together !! Author Steve Browne (Admin)Posted on December 16, 2018 December 16, 2018 Categories HR, LeadershipTags Change, Community, HR, HRonPurpose, HRTribe, Human Resources, intentional, Leadership, networking, SHRMLeave a comment on Convenience or Community ?? The Best Gift to Give !! We’re in the midst of the holiday season. You can’t escape the endless string of Christmas music or the many, many television channels completely dedicated to Christmas movies. Every retail location is decorated to the hilt as well. You can’t escape it. Now, I’m not complaining, and this isn’t a Grinch post railing against the commercialism of the holidays. I enjoy most facets of this season. Most. The one area where I struggle every year is shopping for others. I have never been a list person in any aspect of my life. That isn’t a cry for help and a need for more structure and organization. It’s just a fact. My amazing wife is a list person and it suits her well. So, when she asks for gift ideas for myself or my kids she gets an audible groan. The whole idea of roaming from store to store and aisle to aisle gives me the shakes !! It’s not the thought of spending too much money on things. It’s because I do so much people watching that I don’t pay attention to the items that could be potential purchases. I’m not “focused” according to my family because they are much more apt to locate, compare and acquire. They can accomplish all of their shopping in a matter of hours. This is true whether they go out to stores or browse various internet sites. This year I took a new approach. I changed my attitude about shopping and decided to keep an open mind about the experience. Instead of being filled with dread, I was positive because I included a “gift.” The gift was my time. I chose to intentionally be with my wife and enjoy every interaction and encounter. Ironically, this is how I approach most every day outside of the holiday season. Taking a simple shift in MY attitude made an incredible difference !! For the first time since I can recall, I enjoyed shopping. The lists had beautiful lines running through completed purchases. Debbie and I laughed often and found some surprises outside of the list which filled me with glee. We were even able to get some people watching in. I was patient and kept my wife calm because she doesn’t like large crowds. You see, giving Debbie my time on purpose meant more to her than anything written down on a list. It was a phenomenal reminder of how powerful giving someone else your time is. 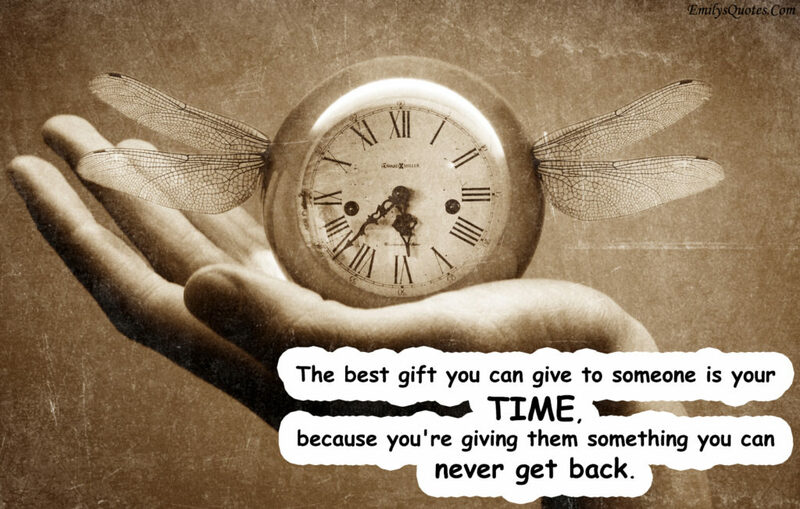 As the quote notes, your time is priceless because you can’t get it back !! It goes to the other person and then time moves on. We all tend to feel that time is fleeting and that we never have enough. That just isn’t true. We get frustrated because we don’t have enough time for what WE want. Our self-centeredness dominates our daily activities and where we choose to spend our time. I’m not pointing fingers because this affects me as well. This week, and this holiday season, shift your approach. Give your time to others. This will take more effort than you think it will. It’s not like you can just turn this off and on like a switch. Giving your time to others takes a concerted effort. I’d even recommend that you start looking at how you can give your time to others on a consistent basis throughout the year. Get ahead of the whole New Year’s resolution nonsense that is just around the corner. Time is something we ALL possess !! Make it your gift. Author Steve Browne (Admin)Posted on December 9, 2018 December 9, 2018 Categories HR, Random ThoughtsTags HR, HRonPurpose, HRTribe, Human Resources, intentional, SHRMLeave a comment on The Best Gift to Give !! Entering December, the last place I thought I’d be was out in my yard doing one last round of yard work, but that’s where I was this Sunday !! I spent over 3 1/2 hours cutting down dead items from our many flower beds, picking up sticks from countless trees and mowing leaves. We have one magnificent maple that never lets it’s leaves drop until at least Thanksgiving. Yesterday we had over an 1 1/2 inches of rain, so yard work was a bit sloppy. At the end of this session of toiling through my clean-up, I was spent. I knew I would be. I’m not complaining in the least. It’s a great feeling to put all of your effort into your work and then collapse. I stumbled into a boiling shower and watched the brown water seep slowly down the drain. I slipped into some tie-dye (of course), jeans and took four Motrin for the impending achefest that was sure to come in the next few hours. I eased down the staircase and plopped on the couch, pulled out my laptop and started this post. Do you lose yourself in your thoughts whenever you have an extended time alone? I absolutely do !! 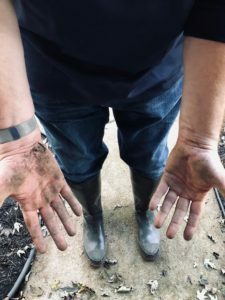 This most recent undertaking allowed my mind to wander and contemplate how getting your hands dirty relates to HR. I admire people who have an occupation using their hands to accomplish their role. I truly do and always have. Being in HR, I tend to be in an office setting more often than not. Now, I understand that an office job is still work. This isn’t comparing one versus another. However, most HR people I know practice at arm’s length. We don’t like jumping in and getting dirty. We’d rather pull out some handbook or manual and slowly flip through each page in order to apply some policy to situations we face. We have the misunderstanding that the written word can solve any interaction we have with employees. It just isn’t true. You see, people are messy AND wonderful !! That is an inevitable fact of being human. So, instead of practicing HR from a visible distance, why don’t you dig in? I think it’s needed because no situation is crystal clear. Not one. You’re missing out by sitting back and trying to “interact” with people from a desk or a manual. Even though the idea of spending hours in my yard meant sure exhaustion. The result of a clean yard and manicured landscaping was worth the time and effort. The same can be said by being intentional and digging in every time you have the opportunity to work with employees. Your time and effort may be taxing and leave you tired at the end of each day. But, isn’t that amazing ?? Whenever I hear my peers yearn for value and validation because of their work in HR, I want to remind them that what they’re looking for is always right in front of them. This week reach out with your hands and dig in !! Author Steve Browne (Admin)Posted on December 2, 2018 December 2, 2018 Categories HRTags HR, HRonPurpose, Human Resources, intentional, SHRM8 Comments on Dig In !! What You Have . . . This past week we celebrated Thanksgiving in the States. It is my favorite holiday because it is a chance to step back, reflect and give thanks for all that you have. We kept things low key as my immediate family gathered. It was wonderful to spend time and cook with my wife and two kids (adults). Everyone pitched in as we put our meal together and each person was responsible for a dish. After eating we watched a little football and then a new Christmas movie on Netflix. The following day we continued our family tradition by putting up Christmas decorations throughout the house as well as lights in the front yard. This time always brings the four of us together and helps us break out of the crazy pace we all seem to follow. The break was needed for all of us. Now, I know this isn’t “unique” to many situations that happened this past week. Most of the people that I regularly talk to, or hang out with, were fortunate to have similar Thanksgiving gatherings. I was reminded, however, about the power of being thankful for what I have . . . not what I lack. Too often our days are filled with all that’s “missing” or desired. Few people ever seem content with how life, work and relationships are going. There seems to be a missing component somehow. If someone is grateful, or satisfied, with how things are going, others seem sarcastic, doubtful or challenging. You may even hear someone retort that if you’re not always going after more and more, then you’re actually slipping behind. To be honest, this negative mindset is exhausting to me. I ache when I hear that people are struggling. I also understand that there are tangible and legitimate mountains that people face every day in regards to all facets of life. I’m not naive. However, I choose to be grateful in the midst of all situations that I face. This runs against the grain of how most people face each day, but I’m good with that. To help in launching a counter movement to what society has to offer, I choose to encourage others, connect others and let others know that I am thankful for who they are. This simple approach is daunting because every comment is often met with resistance. The key is to keep moving forward and be persistent. I truly believe that being genuinely consistent in this approach breaks through in the end. This week take note of all that you currently have in your life regardless of your circumstances. I’m sure that you’ll find a mix of friends, family and connections all within reach. Tell them that you’re grateful for them and how they impact your life. Don’t let it pass by as an assumption. Make a call. Write a note. Send a text. Whatever it takes, let them know how much they matter to you and others. Who knows? It may be just the spark they needed. Author Steve Browne (Admin)Posted on November 25, 2018 November 25, 2018 Categories HR, Leadership, Random ThoughtsTags HR, HRonPurpose, HRPositive, HRTribe, SHRMLeave a comment on What You Have . . .